Quora is a great environment to reach your business audience. That’s the reason my last post covered setting up your profile and explained some of the benefits of Quora. I also touched on answering questions briefly. There’s a lot more to answering questions on Quora though. You want to provide good answers on Quora and not just any answer. A sentence or two with a link to your website won’t cut it. That’s why I wanted to break this topic out and cover deeper on what a good answer on Quora looks like. It’s not easy and it won’t be quick which is why I recommend answering only one or two per day at the most. I typically answer a few a week but that does vary from week to week. The answers that go viral on Quora and help your business the most go deep on answering the question at hand. The answers that do the best include pictures, graphs, data, and more. Not every answer needs to be this deep though but it always helps. Let’s dig into how to answer questions on Quora completely and in depth. Depth and ease of reading are the two keywords you need to focus on for a good Quora answer. You’ll see these two things in common for answers that regularly get upvoted and drive traffic to your website. I’ve posted a number of posts on Quora but they don’t all do well. Sometimes if I don’t give a complete in-depth answer then I don’t get as much visibility. When people ask a question on Quora they really want to know about a topic. That means they want someone to answer their question and not make them do a bunch of research. You have to assume the person asking the question is extremely lazy and doesn’t want to research anything. That’s good for you. Yes it’s somewhat lazy but it’s also good for you because you can make a good impression and more people than just the one you’re writing the answer for will see your answer. That means you need to include as much information as possible in your answer. Include all the information needed in your answer but at the same time it’s necessary to include links to where the info came from. You’ll also want to provide links for further reading that aren’t essential to answering the question. Quora lets you link to external websites and it’s recommended to reference and provide more information about your answer. That’s also a good opportunity to link to your business website. A lot of people browse around Quora for questions to answer so they can help and so they can promote. Your intent should mostly be to help but a little bit of self serving is expected. Take a look at the answers that have done well on this question asked about landing page mistakes. Notice how in-depth some of the answers get? This isn’t the best example of in-depth either, it’s just the best example I could find as I’m writing this. I’ve come across examples at other times from Neil Patel that are quite literally 2,000 to 4,000 words with pictures every few hundred words. I can’t seem to find those right now but if I do I’ll be sure to update this post with a link. The expectation on Quora is that answers will go deep into the subject and provide a lot of value beyond just self promotion. Get into the mindset of helping first and serving your goal second. If you do that then Quora will treat you very well. There’s more than going into depth though. A huge block of text that has the best information still won’t be helpful if it isn’t easy to read. It’s a known fact that people aren’t that interested in reading online. Most people will skim a page and just look at the main points of an article. That means you need to focus on highlighting the main points of your answer so they can be scanned. Someone reading your answer should be able to get the jest of what you’re saying just by reading the headings and bullet points. Use a lot of bold headings to call out different sections. Unfortunately there aren’t title tags on Quora. Use bullet points to make lists of information stand out. Break up the monotony of text with images that are helpful to your answer. Explain more complex ideas with a video even if someone else made it. Going back to the landing page mistakes answers, the most popular answer uses all of these tactics. You can easily browse through the most upvoted answer and see what the biggest mistakes are and it ends with a video that makes the case for the poster’s self promotion. It’s true the answers main goal was self serving but it was also helpful and informative. The answer achieved its goal and made a good case for checking out their service also. Once you’ve written an amazing answer on Quora then you can sit back and watch the views pour in. You could do that but why not help promote such an excellent answer that you took so much time to craft? Your good Quora answers a good opportunity for some social media sharable content and to show off your expertise. Take the opportunity to share your Quora answer on your other social media channels. Quora makes it easy to do so for a reason. It’s beneficial to everyone involved. You get more exposure, more authority, and Quora gets some traffic too. Connect your account to your social media profiles and use the two options in the picture above. You can easily share your answer quickly on Twitter and Facebook. That is if you’re marketing your business on social media already. 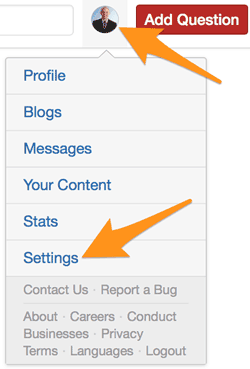 You can connect to your social profiles in the Quora settings. It also lets you connect to your LinkedIn account but that seems to mostly be for making your case for authority. If you forget to select these options when you post then fear not, Quora will ask you again after you’ve posted to share your answers on Twitter or Facebook. You can share on one or the other or even both. Be sure you craft a crafty message to go along with your share though. Don’t waste more time to get started on Quora. The sooner you start the sooner you’ll have a healthy quantity of questions answered. That means more traffic for your website! Quora is based on quality answers that area easy to read but you also want to answer them consistently and regularly. Once question a month is admittedly better than none but one question answered a day is even better. An answer doesn’t have to take you more than 30 minutes to write so keep that in mind. The best way is to get in there and do it. Start by setting up your Quora profile and browsing around for good questions to answer. I’d be happy to discuss with you in a free 30-minute consultation about how to best approach Quora and help you get started.